In Acts chapter 21, Paul learns that when he journeys to Jerusalem, he will be captured by the Jews and handed over to the Gentiles. Paul’s response here is very important. He says, “Why are you weeping and breaking my heart? I am ready not only to be bound, but also to die in Jerusalem for the name of the Lord Jesus.” (Acts 21:13) The key phrase is “I am ready”. This tells me that Paul was already aware, at least, that something unpleasant was going to take place when he reached Jerusalem, and the Holy Spirit had already prepared him for the event. Therefore, upon learning the exact nature of the event that would occur, his response is that he is ready. Do you suppose that if Paul had learned on the road to Damascus that he would one day be turned over to the Gentiles and eventually killed that he would have so readily followed Jesus? That is a hard question to answer, but I have a feeling that he would not. But over time, day by day, and bit by bit, as Paul’s faith grew ever stronger, the Lord revealed to him, a bit at a time, exactly what would be required of him, until, eventually, when he learns of his eventual demise, he is able to respond, “I am ready”. And it is the same with us. Our God does not reveal to us what we will be enduring five years from now, or ten. But He does faithfully prepare us for what will happen today, tomorrow, or next week. And as we grow in our faith, the Lord will trust us with ever larger and more specific revelations about our circumstances and what we must endure for His sake. So, what about you Christian, are you ready? Lord, I bow humbly before you as I seek your will for me life, trusting that You will fill me always with your Spirit so that when asked, my response will always be, “Yes Lord, I am ready!” Amen. O’ LORD make me ready for service as well as for THY coming!. Amen. God bless! Thank you for spreading His word. I agree very strongly with what you have shared with this post. I would like to add that Paul’s call for nonviolence is what is most beautiful. 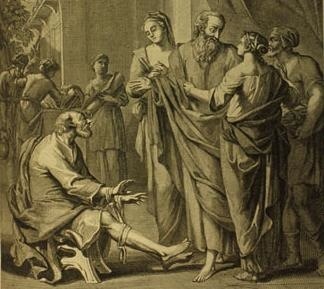 This is shown most poignantly in the image of Paul offering “to be bound,” as you have reminded us he was ready, in the name of the Lord Jesus. Our Saviors greatest teaching was in nonviolence. As servants of God’s peace, we must follow Paul’s transformation out of a life of violence by God’s will. So important in our lives today, all of humanity is blessed. Thou shalt not kill. Exodus 20:13. John thank you for Paul’s word today, and preparing us for a more peaceful tomorrow. Hi Adam, Thanks for stopping by, and God bless you. While I can’t disagree with you concerning our Lord’s message of peace and non-violence, I do not believe that we can afford to let wisdom go by the way-side in dealing with others. For example, if we as a nation have an enemy bent on our destruction, we have two choices: We can either defend ourselves against external attack, or we can be consumed by our enemy and forced to perform the very evil that made them our enemy in the first place. While non-violence works better on the individual level, I do not think it will occur universally before the Lord returns and establishes His Kingdom. On this one I’ll have to disagree. When he went from persecuting Christ (Acts 9:4) to suddenly proclaiming his word (9:20) I believe he realized having been on the inside of the group of persecutors that he was immediately the greatest threat and primary target as evidenced by the events of 9:23-25. Much of the NT was the result of the events and communications of Paul as God had placed a superior intellect in him. That intellect, coupled with Paul seeming to be an ‘all in’ sort of fellow leads me to believe he knew early one he would pay a similar price for his faith that he had witnessed from Stephen and those Saul had brought an end to. I see where you are coming from, and perhaps you are right. Maybe I should find another example of God’s progressive revelation, eh? Anyway, thanks for stopping by and adding to the discussion, God bless, and also, thanks for reblogging this post. I believe he may have known – once he realized he was wrong to kill the Christians, I think he was ready to face the idea that this would fairly be his own end – and zealous enough to face it. Hi Michael, thanks for stopping by, and God bless! I would be inclined to disagree on the idea that he knew his end from the time of his conversion, Michael, though I wouldn’t go so far as to discount the possibility that you are right. Even so, I doubt that he knew where, when and how at the time of his conversion in chapter 9, but somewhere between chapter 9 and chapter 21 he learned a lot more of the details.